Geneva, 12 September 2014 – From Sunday 14 September, international trade in specimens of five shark species and all manta ray species, including their meat, gills and fins, will need to be accompanied by permits and certificates confirming that they have been harvested sustainably and legally. New controls adopted by the Convention on International Trade in Endangered Species of Wild Fauna and Flora (CITES) will apply to the oceanic whitetip shark (Carcharhinus longimanus), scalloped hammerhead shark (Sphyrna lewini), great hammerhead shark (Sphyrna mokarran), smooth hammerhead shark (Sphyrna zygaena), porbeagle shark (Lamna nasus) and manta rays (Manta spp.) as they are now included in CITES Appendix II. Under CITES, exports and re-exports of the new listed species will not be allowed from any of the 180 States Parties unless they have been authorized by the designated national authorities. Importing consumer States will play their part by ensuring that the correct permits and certificates are present with all shipments. This is a system of unparalleled global cooperation to prevent over-harvesting of these species for international trade. All trade will need to be declared and controlled by Customs authorities and reported to the CITES Secretariat and the data will be made publicly available. Although this is not the first listing of sharks in the CITES Appendices, it is the first time that shark species of great commercial value, and traded in high volumes, have been included in Appendix II, thereby requiring verification of the sustainability and legality of the trade. According to FAO, the global reported annual shark catches from 2000 to 2009 ranged between 750,000 and 900,000 tonnes. The listings offer great opportunities for CITES Parties and the world’s fishery communities to take advantage of the CITES universal controls to help ensure that the harvesting of these highly traded marine species is better managed. An Appendix-II listing under CITES is designed to ensure that commercial international trade is strictly regulated to ensure its sustainability, legality and traceability for the long-term survival of the species in the wild. The decision to list these species was taken by Parties on 14 March 2013, but the entry into effect was delayed until 14 September 2014 to give Parties time to resolve technical and administrative issues in the control of the trade. Sharks and manta rays are consumed in many parts of the world. Shark fin soup is served at important events such as weddings and banquets in parts of Asia, while fish and chip meals are often made from shark meat in Europe. Over the past 18 months we have witnessed a global collective effort to prepare for the implementation of these new listings, involving countries from across every region, intergovernmental bodies such as the FAO, and many non-governmental organizations. These include Australia, Brazil, China, Colombia, Fiji, Germany, India, Morocco, New Zealand, United States of America, FAO, World Customs Organization, Organization of American States, Regional Fisheries Management Organizations (RFMOs), Southeast Asia Fisheries Development Center, Organizacion del Sector Pesquero y Acuicola del Istmo Centroamericano (OSPESCA, Organization of Fishing and Aquaculture in Central America), Pew Charitable Trusts, SOS – Save Our Species, Oceana, International Fund for Animal Welfare (IFAW), Humane Society, WildAid, TRAFFIC and Monterey Aquarium, to name but a few. The Secretariats of CITES and FAO benefited from new sources of funding provided by the European Union (EU), and technical and financial support from other partners that have contributed to put in place the necessary tools and measures to implement the listings. Buoyed by the generous contribution of €1.2 million from the EU to address the challenge, CITES and FAO have worked collaboratively in order to bring the fisheries and CITES communities together in key shark fishing and trading nations. Close coordination by RFMOs and Regional Fishery Bodies (RFBs) at the regional level, and national fisheries agencies at the local level is critical for the effective implementation of these new listings. Much effort has gone into engaging directly with these entities, which will continue to ensure that CITES requirements are complementary to existing measures and contribute to good overall fisheries management. “It is through global, regional and national collaboration that we will effectively implement these new listings. This global collaborative effort is the most comprehensive we have seen in the 40 year history of the Convention to prepare for the implementation of a new CITES listing,“ concluded Mr Scanlon. Several countries have entered reservations on some or all of these species: Denmark, on behalf of Greenland (porbeagle shark), Canada, Guyana (all five shark species and the manta rays), Japan (all five shark species), Iceland (porbeagle shark) and Yemen (the three hammerhead sharks). This means that they will not be bound by CITES regulations regarding trade in these species. However, in the case of trade with States that are CITES Parties and that have not entered a reservation, the usual permits or certificates will be required. With 180 Member States, CITES remains one of the world's most powerful tools for biodiversity conservation through the regulation of international trade in wild fauna and flora. CITES regulates international trade in close to 35,000 species of plants and animals, including their parts and derivatives, ensuring their survival in the wild with benefits for the livelihoods of local people and the global environment. The CITES permit system seeks to ensure that international trade in listed species is sustainable, legal and traceable. Millions of products containing parts and derivatives from CITES species are internationally traded and used by people in their daily lives for food, housing, health care, ecotourism, cosmetics or fashion. The adoption of the shark and ray listings at the 16th meeting of the Conference of the Parties (CoPI6) in March 2013 in Bangkok, Thailand, was an important step towards ensuring their international trade is legal, sustainable and traceable. Effective implementation of the listings is even more essential for the protection of these endangered species listed in CITES Appendices. The COP16 results are directly linked to the commitments made by the international community on sustainable fisheries during RIO+20. As the specialized UN agency for fisheries and aquaculture, FAO has the mandate for the conservation and sustainable use of aquatic resources, including sharks and rays. More than a decade ago, the twenty-third session of the FAO Committee on Fisheries in February 1999 adopted the International Plan of Action for the conservation and management of sharks. Since then, FAO has organized workshops and developed guidelines to help member countries in developing capacity and providing technical support in the effort to protect all shark and ray species. FAO is now continuing its effort and developing a shark fin guide which will enable automatic identification of shark fins through image recognition software. Since the listing of sharks and rays, FAO has been in close collaboration with the CITES Secretariat in various initiatives and activities to provide shark-fishing States with technical support and operational guidance, including the FAO-CITES joint regional capacity evaluation workshops and side events at COFI-31, COFI-FT, CITES Animal Committee -27 and other important international meetings. 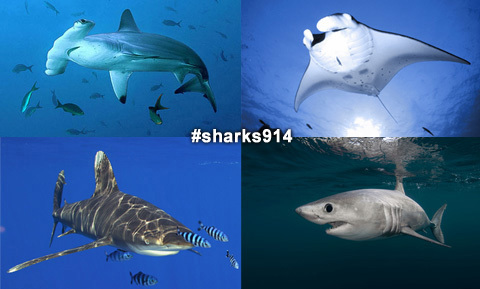 FAO will continue its effort and work closely with CITES on immediate actions in support of the implementation of CITES listings of sharks and manta rays, including legal assistance for fishery legislation, support to the development and implementation of National Plans of Action for sharks and rays, and activities on international fish trade and traceability.